Paper piecing….It all started with a clock. Here I had always wanted to try paper piecing. So I figured why not start with something pretty simple. After hunting the internet for a pattern I came across this Circle of Geese by Piece by Number to make 12″ block on Pinterest. 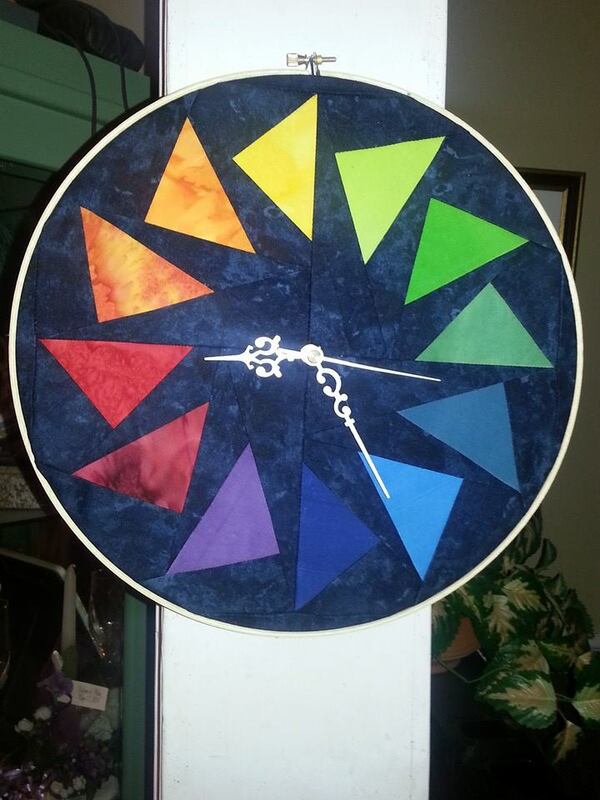 I had so much fun making my clock I wanted it to represent a color wheel for my sewing room. After making 4 of the geese blocks.Reverse your pattern other wise your clock will run BACKWARDS as my kids say. I traced the outer circle of the inner hoop in stiff cardboard. I Stretched the block over the inner frame and put on the outer frame with the stretching screw at the top. Then I pressed the cardboard into place hiding the excess fabric. I did have to trim the cardboard abit to make it fit snug. Now I punched a hole in the center where the clock motor would go . Since my needles were gold they did not show up well so I choose to paint them white. Next step was to press the motor into place on the back side. I taped the clock motor to the cardboard in the back. Once my needles were dry I pressed them onto the shaft added a battery and voila clock done. This is my humble beginnings into the paper piecing world. Im hooked…..
My next project was not so simple I did the Cattails in the Meadow pattern by Judy Neimeyer. Of course I had to add my own spin to this one also. I just can’t leave a pattern alone. As I made this quilt I photographed each step so later I will do a blog on my progress with this pattern from start to finish. Whoa – that’s brilliant! And I love your quilt!!! Thanks. Allie. had to laugh when my boys saw it the first time they said mom whys it running backwards. lol I had not even noticed that the geese were pointing the opposite direction. This is a fantastic idea! When I set up my sewing room, I’d like to give this a try! thank you. its fun and I glance at it quite often when I’m looking for color schemes. what is complimentarary ect. I have one all done. I just have to wait to get the material. your correct designing my own patterns is fun.